Every month the men of our church gather for a men's breakfast. It's the typical thing that you would expect, lots of gravy, bacon, biscuits, another conversation thrown in. The conversation revolves around the things that you might expect to happen at a men's breakfast in a rural community. There's always talk of hunting, or fishing, or maybe working on cars or other manly type activities. Occasionally and gets in the politics, although we try to limit that. And the conversation is always followed up by a devotion, a reflection on scripture from one of the men and usually a time of prayer. It's something that I have come to look forward to as a pastor, both for the fellowship, the conversation, and the devotions. Last month the conversation turned to a new topic, the impact of technology and social media in society and how we as a church can help speak to some of those things. They were all types of opinions represented, some by people who don't have social media and barely use email, and others by people who are as fully invested in it as anyone could be. Some thought it was just a problem among young people, and others seemed to think if we would only read our bible and pray more then all that would work itself out. For most of the men, they acknowledged it was a problem but weren't sure what they as leaders or we as a church should do about it. This conversation was fresh on my mind when I received a copy of a new book in the mail that speaks to just such issues. 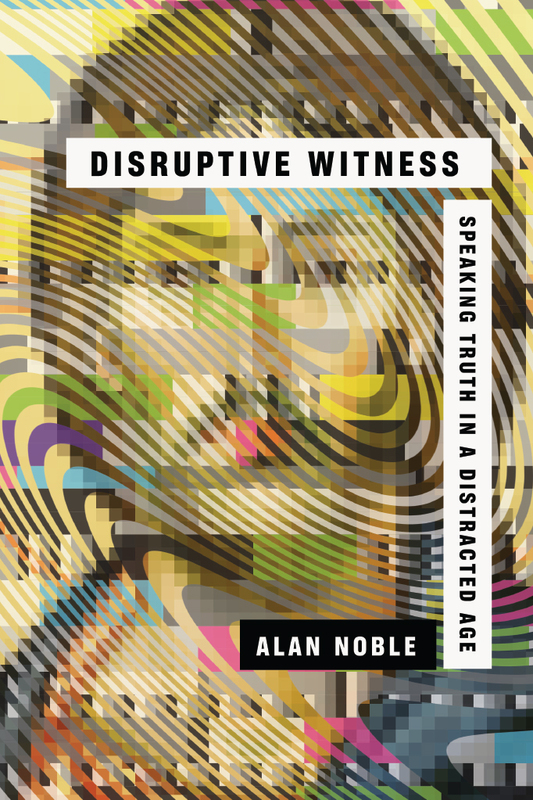 Disruptive Witness: Speaking Truth in A Distracted Age is the new book by O. Alan Noble, a professor of English at Oklahoma Baptist University and has written for various media outlets around the country. The goal of this book is to help Christians think about how we can "plow" up the soil of our culture in order to plant the gospel more effectively. Noble lays out ways we can go beyond the shallow views of beauty and life of our digital age and point people to a deeper beauty that can only be found in Jesus Christ. He builds on the work of philosopher Charles Taylor (who I had never heard of before this) to show that Christians must find ways to share the gospel that grab the attention of a distracted world. In the first part of the book, Noble speaks of the barrier of endless distraction by using an example of his daily routine, which most readers will find similar to theirs. There are many people who have lamented the distractions of our age. Noble appreciates the good things that technology brings, and does a good job of showing us that if churches don't teach people how to use technologically wisely then no one else will. Part of using technology wisely is challenging the assumptions that come with it, like the ideas that we must always be connected or even that all technology is neutral and must be immediately adapted in the church. Using the example of the "Jesus Daily" page on Facebook, he illustrates that when we share the verses and images of Jesus on our page then to our friends "the images are indistinguishable from all other random content we quickly share and forget on social media. The gospel appears thin, superficial, and inconsequential- just another image vying for our time." The challenge for Christians should not be how to make technology "christian," like the christian mobile video games. Rather the greater challenge is how to use this technology in a way that allows us to be in the world and not of it. More to the point, how do we make the gospel stand out in a world that is oversaturated with stories and information? Noble's answer, in part, is that we move away from the individual views of personal fulfillment and look for something greater outside of ourselves. In other words, we have to consciously make an effort to find Christ daily or we will be overwhelmed by a society that longs to have every second of our attention. "We have an obligation to examine ourselves and see how we may unknowingly find our meaning and justification in one of the billion micro narratives that fill our culture. " The last section of the book focuses on just how we can go about doing this, making the gospel stand out from the world around it. He focuses on what he calls "disruptive personal habits" and "disruptive church practices" as ways Christians should fight agains the culture that seems to overwhelm us. I appreciate his stance that unless there is a cultural upheaval along the lines of the printing press then we will not be able to move out of this age any time soon. Nor can we just argue our way out of it, and instead we might expect it to get worse. Despite the overwhelming odds, we cannot stay silent. We have the greatest story ever told while society falls for lesser versions of it every day. Disruptive personal habits are a way we can interrupt the natural flow of culture and grab people's hearts and minds with Christ. By disruptive, I think Noble means that we should plow up the soil of culture instead of just sighing and saying "this soil is rocky, oh well." The best way we can adopt these disruptive personal habits is to shift from seeing ourselves as the end of us, and instead find our meaning and purposes in the transcendent God. On a personal level this involves continually working to turn our thoughts toward God, whether we are looking at patch of wildflowers, a work of art, or a movie on TV. The world does this in part, but does not complete what he calls the "double movement" towards Christ. In the double movement we are looking to honor God whether we eat or drink, as Paul says. This includes self contemplation in a way that doesn't end on ourselves but then moves us towards God as the place we find our being and focus. In a church this involves the use of liturgy, the church calendar, scripture reading, public prayer, and even the dreaded greeting time. All of these things can serve to remind us that there is something greater than us in this world, and will then be "disruptive" to all those who see it. As someone who grew up in fundamentalist Christian environment, there are parts of me that are leery of attempts to redeem culture even if it is to move our focus off it towards God. But I think Noble does a good job of illustrating the frivolity of such distractions while still enjoying the inherent beauty in culture as well. He walks the tightrope between enjoying the blessings of our distracted age while not being overwhelmed by it. Many reject the Amish lifestyle but then embrace wholeheartedly every digital device and distraction the world can think up. Noble shows that we must think about how those things affect us, and how we can stand with one foot in this world and one foot in the next. The thing I found most helpful about Disruptive Witness was the simplicity behind it. What Noble is advocating is not ground breaking or earth shattering stuff. Rather, much of it is a return to what Christians have done for 2,000 years. In the loss of cultural Christianity, the world has lost many things that they benefited from, even if they didn't know it. The traditional church calendar, the practices of meditation and prayer before meals are examples of the things that regularly shaped peoples hearts and minds without them being fully aware of it. One of the most important things we can do in our own lives to be self aware, to think about the way our use of technology impacts us. Simple things, like walking in the woods without taking pictures, or listening to a podcast, or even talking with a friend can help us orient our lives around something greater than ourselves. Whenever I walk in the woods by my house I'm reminded how all of this happens without me doing anything about it. Trees grow for decades without me, animals live and die and hunt and migrate and flowers blossom and die. All of this reminds me there is something greater than myself. I am not even the center of my own tiny corner of the world. When we use technology in way that helps us be aware of God's greatness and our dependence on Him, we will begin to be disruptive witnesses. Noble calls this "creating space for reflection by cutting down on filler distractions." Make dinner without the tv on, commute without a podcast, just do one thing without doing something else. I really appreciated the section on Sabbath rest, and the need to find rest in the middle of lives that are constantly moving. "Stop seeing "unproductive" time as a problem to be solved and instead open yourself up to the possibility of undirected thought." Even things like staring at a painting or photograph, even ones by amateurs, helps us think beyond our normally shallow lives. Noble touches briefly on aesthetics, but I would like to hear more from him on this subject. I think the commercialization and mass production of art has made us numb to real art that happens around us. Perhaps thats for another book? What I do wish Noble had addressed more in the disruptive personal habits section is how the application of classic spiritual disciplines like scripture reading, meditation, and prayer will help us to live in the way he recommends. He touches briefly on this subjects, and little longer on the practice of saying grace before meals and Sabbath, but I think this section could be further expanded to show that the Church has had the answer all along for how to direct our thoughts toward God in the middle of whatever culture we face. A life that makes time for simple spiritual disciplines will stand in stark contrast to the world around it. I don't doubt that Noble would agree with this sentiment, but in the limits of the book it's easy to get lost. A disruptive witness is as much about "don't do this" as it "do these things." 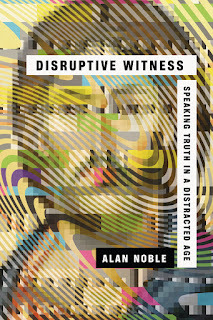 I had not read much of Alan Noble before, and I expected the book to be much more of a philosophy book than the practical and helpful book it was. Living as disruptive witnesses is not complex, but it will take intention to swim against the world we all live in.